Treatment of steatocystoma multiplex with the existing modalities of management, is often cumbersome and, sometimes, frustrating. The incisional, excisional and sclerotic methods, all have their limitations. The proposed technique, in the present study, is an improvisation of the incisinal and excisional methods with some modifications by electro surgical techniques. The result is encouraging in almost all the patients with lesions over different regions of their bodies. Fifty HIV infected cases with mucocutaneous disorders were classified according to CDC classification of HIV disease (1987). Fungal infections were the commonest, followed by viral and bacterial infections and miscellaneous disorders. Oral candidiasis was the commonest fungal infection and association with dysphagia, an AIDS defining condition, was noted in 11 cases in our study. Dermatophytosis was the next frequent fungal disorder observed in 14 cases. Out of the viral infections, herpes simplex was the most frequent disorder. A total of 125 mucocutaneous disorders was diagnosed in our 50 patients. A mean value of 1.71 diagnoses per patient was observed in stage II of HIV disease whereas in stage III of IV, it was 2.0 and 3.0 diagnoses per patient respectively, clearly showing that number of dermatoses increased with the progression of HIV disease. Fifteen very fair women with mild to moderate photoaging in there 60â€™s were tested by doubled blind immunohistological study. Tretinoin 0.05% cream applied daily was compared to its vehicle with regards to epidermal, basal, spinous differentiation markers and dendritic cells (Langerhanâ€™s and melariocyte). In comparison with the control skin, tretinoin-treated skin showed the following changes: 1. From atrophy to normalization or hyperplasia of horny and prickle cell layers,2. Granular layer was normal to hypertrophied, 3. Basal cells were well-stained and thicker, 4. Basement membrane was thicker to normal in appearance and 5. Dendritic cells were increased in number (Langerhanâ€™s). These results demonstrated a decelerating effect of tretinoin on the time clock of photoaging. Experimental studies were conducted in four groups of rabbits using external ear canal for inducing comedogenesis and its correction by a herbal formulation, viz., SK-AC cream. The result brought out that the SK-AC cream restricted the comedogenesis induced by acetylated lanolin alcohol when compared with other defined groups. Microcomedo being the basic pathology of acne, the outcome of this experiment pointed out the usefulness of SK-AC cream for the treatment of acne. Dry skin is a common problem both in healthy individuates and in patients with skin diseases. In all cases, emollients play important role in rehydrating the stratum corneum. To evaluate the efficacy of a new emollient, thirty-six patients with symptomatic dry skin disorders were enrolled. They were given the test emollient cream for topical application twice daily for 3 weeks and followed up weekly. Subjective complaints included pruritus and discomfort while objective parameters included scaling, erythema, roughness of skin, fissuring and hypopigmentation. Treatment with the test emollient cream reduced the severity in a majority of patients. Moreover, being free of perfume, co lour, urea and lanolin, the test cream was well tolerated by all participants. Usual type of dystrophic calcinosis cutis is described in six females in the perimentopausal age group with the lesions in the hip region along with their clinical, biochemical, histological and radiological features. The probable causes of calcinosis are discussed. This is the first report of dystrophic calcinosis of this kind can aptly be called idiopathic perimenopausal dystrophic calcinosis cutis. A 34 year old male having a noduloulcerative lesion on the left cheek, presented as a clinical problem, was diagnosed as nodular hidradenoma on histropathlogical examination. The case is reported for its unusual presentation. Three adults (2M, 1F) with Gorlinâ€™s Syndrome are presented. All three had characteristic facies, multiple small basal cell carcinomas on the centrofacial region and pitting of plams and soles. The first patient, male aged 52 year, also had ulcerated basal cell carcinomas on chest, nape of neck and left temporal region, multiple cysts, chalazion and scoliosis. Two patients had repeated episodes of periodically discharging swellings on lower jaw. Skin biopsy of the popular lesions in all three cases revealed basal cell carcinomas. All cases had radiological evidence of osseous abnormalities which included fusion of ribs and vertebrae in one case, lytic lesions of the mandiable in two cases and calcification of the flax cerebri in two cases. The small basal cell carcinomas were treated with electrodessication and cryotherapy; the larger lesions were surgically excised. Patients were counseled and continued to follow up with occasional development of new lesions. Human immunodeficiency virus (HIV) associated follicular syndrome, also called pityriasis rubra pilaris type VI (PRP VI) has been described in a male patient with the characteristic clinical histological and immunological features. A rare case of radiation induced localized bullous pemphigoid is described in a 42 year old woman having left parotid gland carcinoma. Two cases of tuberculosis cutis associated with hymphoedema are presented with clinical and histopathological features. Both the patients responded to the usual line of antituberculous therapy with the resolution of the lesions though the lymphoedema persisted. 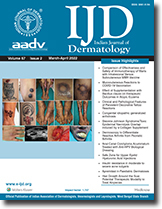 A six year old child with recurrent and multiple lesions of pyoderma gangrenosum is reported. The disease was resistant to conventional modalities of treatment. He was treated with pulse therapy in the form of 32 mg dexamthasone in 200 ml of 5% glucose by slow intravenous drip on two consecutive days. The pulses were repeated at two week intervals. Five such pulses led to complete and sustained healing of all the lesions. A case of herpes zoster in a 3 month old female infant is reported. The patient suffered from varicella 1 month prior to onset of herpes zoster, following varicella of mother. Most reported cases of infantile herpes zoster, likely, suffered from varicella during intrauterine life due to maternal varicella during gestational period. Both varicella and herpes zoster during infancy are rare. The disease had an uneventful course with spontaneous healing in our patient.